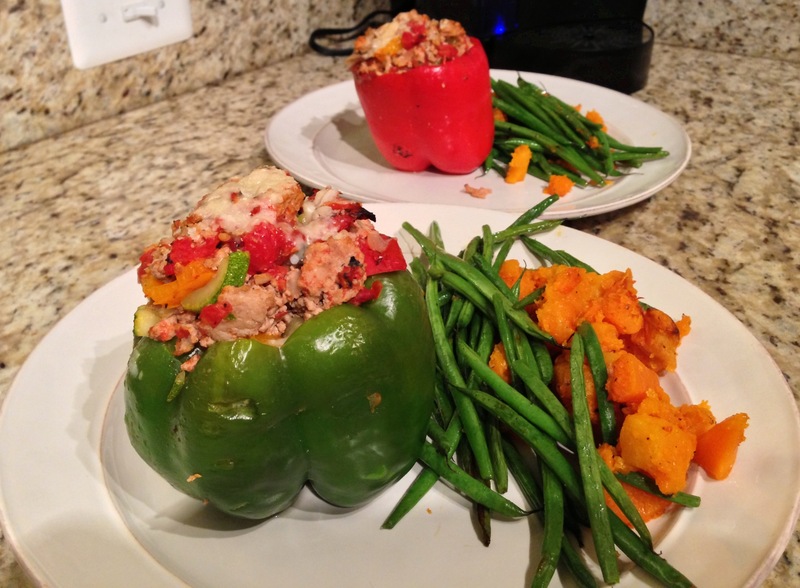 Healthy Stuffed Peppers – YUM! I always love healthy alternatives to favorite dishes. This is easy and ready to serve in 30 minutes! Nothing is better than a quick healthy dinner on a week night. I served it with roasted butternut squash and green beans but it would also be delicious with a yummy salad. Enjoy! · 1 (14.5 ounce) can diced tomatoes, drained. I used fire roasted for extra flavor! 2. Wrap the bell peppers in aluminum foil, and place in a baking dish. Bake for 15 minutes in the oven. Remove from heat. 3. In a skillet over medium heat, cook the turkey until evenly brown. Set aside. Heat oil in the skillet, and cook onion, mushrooms, zucchini, red bell pepper, and yellow bell pepper. Return turkey to the skillet. Mix in the tomatoes and tomato paste and season with Italian seasoning, garlic powder, salt, and pepper. Stuff the peppers with the skillet mixture. 4. Return the stuffed peppers to the oven, and continue cooking for 15 minutes. And enjoy—without any regrets!